The awesome people over at COBY sent me a couple of awesome Easter basket gift ideas. Now days teenage kids aren’t content with candy and trinkets so why not give them something they will actually use…and love! First up they sent me a pair of COBY Light-up Wireless Headphones. They offer a really nice crisp and clear sound. I like that you can even answer phone calls with the touch of a button and not have to even take your phone out of your pocket. The headphones even have built-in lights on the sides that flash along to the music which is cool too. My daughter was checking them out and thought it was fun to listen to her music in her bedroom in the dark so she could see them lighting up. Speaking of flashing lights, the Coby Light-Up Bluetooth Speaker also plays lights along with your music. And just like the headphones offers crisp, clear sound as well as the ability to answer phone calls with the touch of a button. Both of these are Bluetooth capable so you don’t have to plug anything into them to listen to the music from your device. I used both of them with my iPhone and had no issues connecting via Bluetooth connection. I was able to use all of the functions on each of them with ease. Well at least until I was done testing them, after that my daughter took the headphones and my teenage son took the speaker. 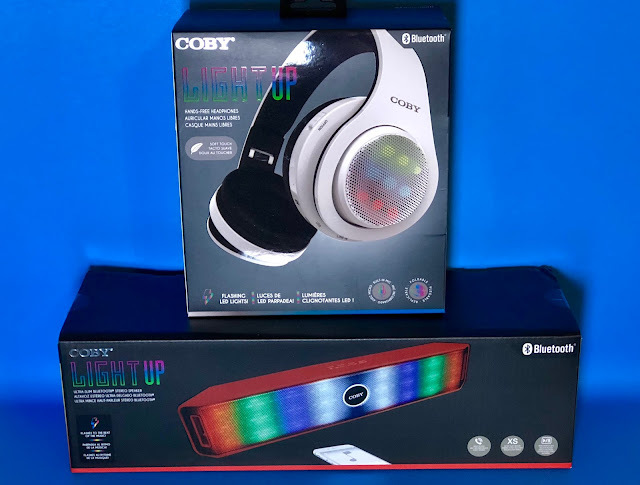 A market leader for over 30 years, COBY® was founded in 1991 and quickly became known for innovative electronics that give consumers the premium features they’re looking for at affordable prices. 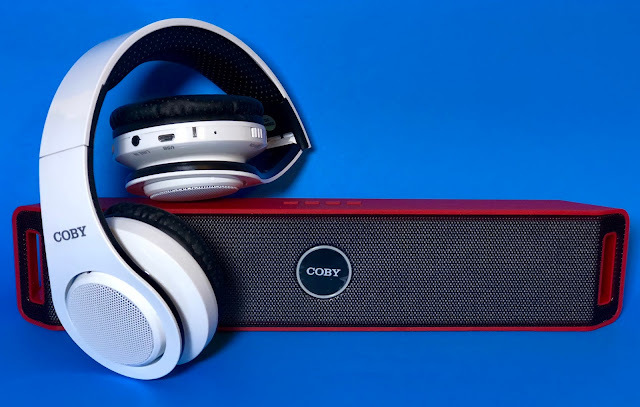 As a globally recognized brand registered in over 50 countries, COBY offers the possibility of ubiquitous extensions to a variety of industries, and is currently best known for creating audio and visual products and accessories that deliver a quality entertainment experience. COBY® is about connections. It’s the link between people and technology, innovation and attainability.